Standoff • "Uncut" video shows her husband was targeted and gave himself up to protect others, she says. FILE - This photo taken from an FBI video shows Robert "LaVoy" Finicum after he was fatally shot by police Tuesday, Jan. 26, 2016 near Burns, Ore. On Tuesday, March 8, 2016, authorities said police were justified in killing Finicum. 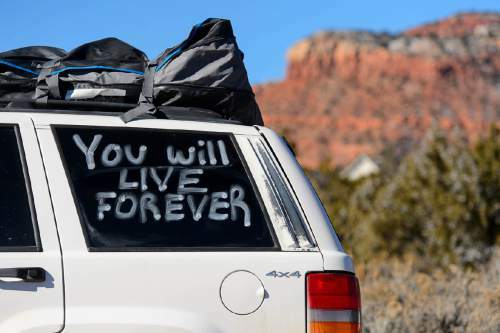 (FBI via AP, file) Trent Nelson | The Salt Lake Tribune "You Will Live Forever", written on a vehicle at the funeral for Robert "LaVoy" Finicum, in Kanab, Friday February 5, 2016. Finicum was shot and killed by police during a January 26 traffic stop. Finicum was part of the armed occupation of an Oregon wildlife refuge. 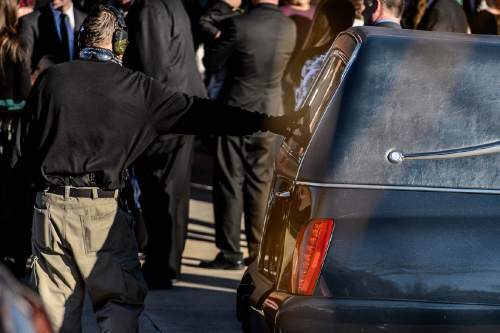 Trent Nelson | The Salt Lake Tribune A man openly carrying two handguns pays his respect to the hearse, at the funeral for Robert "LaVoy" Finicum, in Kanab, Friday February 5, 2016. Finicum was shot and killed by police during a January 26 traffic stop. Finicum was part of the armed occupation of an Oregon wildlife refuge. Trent Nelson | The Salt Lake Tribune Thara Tenney, daughter of Robert "LaVoy" Finicum, embraces her mother Jeanette Finicum, following his funeral in Kanab, Friday February 5, 2016. Finicum was shot and killed by police during a January 26 traffic stop. Finicum was part of the armed occupation of an Oregon wildlife refuge. 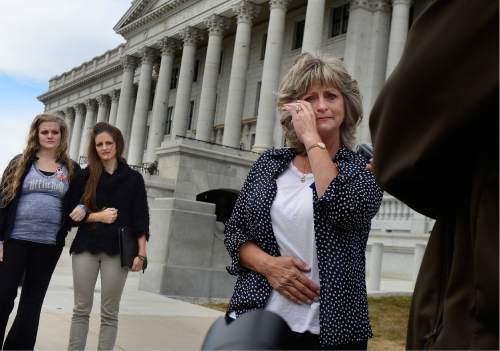 Scott Sommerdorf | The Salt Lake Tribune LaVoy Finicum's family, widow Jeanette, far left, daughter Thara Tenney, and Brittney Beck at far right speaking to the media as they held a rally at the Utah State Capitol, Saturday, March 5, 2016. 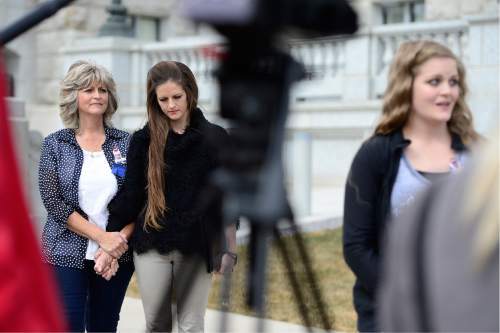 Scott Sommerdorf | The Salt Lake Tribune LaVoy Finicum's widow, Jeanette speaks about what she called her husband's "assasination" while speaking to the media prior to a rally at the Utah State Capitol, Saturday, March 5, 2016. Scott Sommerdorf | The Salt Lake Tribune LaVoy Finicum's widow, Jeanette wipes away a tear as she talks about what she called her husband's "assasination" while speaking to the media prior to a rally at the Utah State Capitol, Saturday, March 5, 2016. 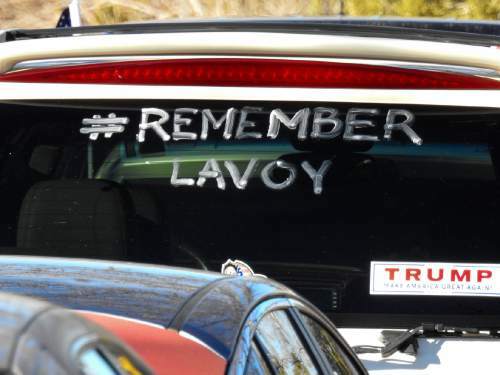 Trent Nelson | The Salt Lake Tribune #Remember LaVoy, written on a vehicle at the funeral for Robert "LaVoy" Finicum, in Kanab, Friday February 5, 2016. 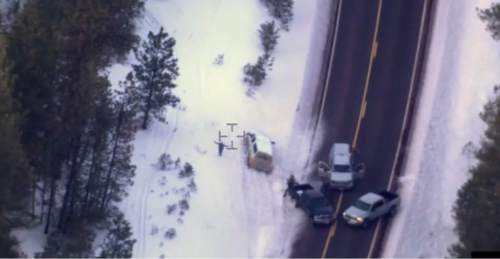 Finicum was shot and killed by police during a January 26 traffic stop. Finicum was part of the armed occupation of an Oregon wildlife refuge. 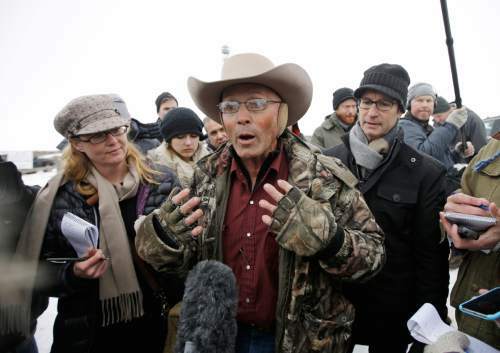 FILE - In this Jan. 9, 2016 file photo, LaVoy Finicum, a rancher from Arizona, speaks to the media after members of an armed group along with several other organizations arrive at the at the Malheur National Wildlife Refuge near Burns, Ore. The FBI and Oregon State Police arrested the leaders of an armed group that has occupied a national wildlife refuge for the past three weeks during a traffic stop that prompted gunfire  and one death  along a highway through the frozen high country. 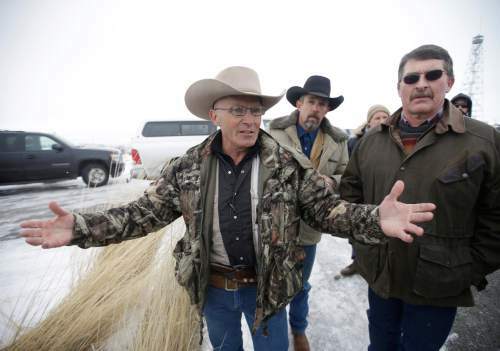 The Oregonian reported that Finicum was the person killed, citing the man's daughter. (AP Photo/Rick Bowmer) LaVoy Finicum, a rancher from Arizona, who is part of the group occupying the Malheur National Wildlife Refuge speaks with reporters during a news conference at the the refuge Tuesday, Jan. 5, 2016, near Burns, Ore. At the time, law enforcement had yet to take any action against the group numbering close to two dozen who are upset over federal land policy. Finicum said the group would examine the underlying land ownership transactions to begin to "unwind it," stating he was eager to leave Oregon. 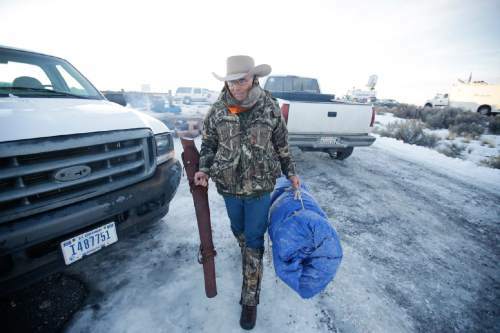 (AP Photo/Rick Bowmer) FILE - In this Jan. 6, 2016 file photo, Arizona rancher LaVoy Finicum carries his rifle after standing guard all night at the Malheur National Wildlife Refuge near Burns, Ore. The FBI and Oregon State Police arrested the leaders of an armed group that has occupied a national wildlife refuge for the past three weeks during a traffic stop that prompted gunfire, and one death, along a highway through the frozen high country. 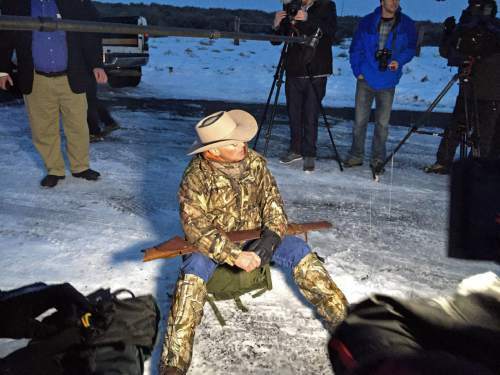 The Oregonian reported that Finicum was the person killed, citing the man's daughter. (AP photo/Rick Bowmer) Arizona rancher LaVoy Finicum, holding rifle, speaks to reporters at the Malheur National Wildlife Refuge, Tuesday, Jan. 5, 2016, near Burns, Ore. Ammon Bundy, the leader of a small, armed group that is occupying a remote national wildlife preserve in Oregon said Tuesday that they will go home when a plan is in place to turn over management of federal lands to locals. (AP Photo/Rebecca Boone) Scott Sommerdorf | The Salt Lake Tribune LaVoy Finicum's widow, Jeanette speaks about what she called her husband's "assasination" and describes that she feels he had his hands up when he was shot, as she was speaking to the media prior to a rally at the Utah State Capitol on Saturday. The wife of Robert "LaVoy" Finicum said she&apos;ll continue to defend what she believes he died for on a rural stretch of highway in eastern Oregon. 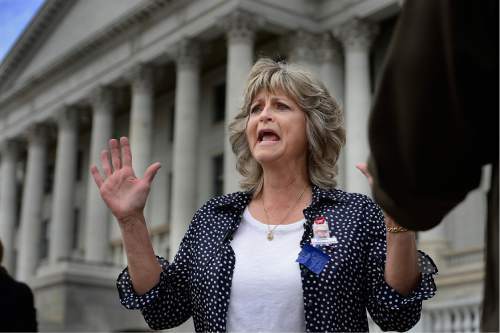 Having had a day to digest investigators&apos; finding that state police were justified in shooting her husband three times through the back, Jeanette Finicum announced Wednesday that she intends to sue. The weekslong probe by the Deschutes County Sheriff&apos;s Office, she said in a statement, amounts to a "whitewash." "My lawyers have already discussed with me how the facts will show that the officers intended to shoot LaVoy, how an informant arranged for him to be in the lead truck, how the officers started shooting at the truck to force it to stop and then, finally, how my husband gave himself up in order to draw attention away from the others in the truck." LaVoy Finicum, 54, was effectively the spokesman for the armed occupation of the Malheur National Wildlife Refuge. Hours after speaking to assembled media at the Washington County Building in St. George on Wednesday, Jeanette Finicum said in a phone call to The Tribune that she feels "driven" to pick up where he left off. Her husband refused to pay grazing fees for the cows at their Arizona Strip ranch  now run by 18-year-old daughter Tean Finicum  after siding with Cliven Bundy in his 2014 standoff with the federal government in Bunkerville, Nev.
Jeanette wouldn&apos;t say whether she plans to settle up with the Bureau of Land Management. But she did relate that in the days following her husband&apos;s death on Jan. 26 and before his Feb. 5 funeral, she heard rumors that the BLM would soon impound her cows. She then asked Mohave County, Ariz., Sheriff Jim McCabe if he&apos;d support her "by standing between me and whoever was going to take my cows." McCabe told her "you&apos;d better not be armed," she said, to which she responded: "I don&apos;t know what that has to do with my question." McCabe didn&apos;t respond to a request for comment Wednesday afternoon. Finicum said she receives about 1,000 to 2,000 emails per day, she said, and "letters are coming in by the droves." 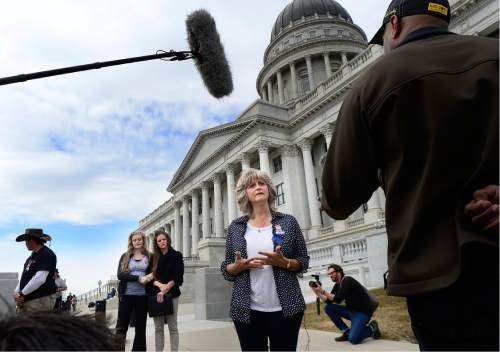 She spoke to hundreds of supporters from the steps of the Utah Capitol on Saturday, telling them her husband was "assassinated." Investigators used "selectively edited video" to show her husband reaching for a loaded gun, she said in her Wednesday statement, adding that in the "uncut" version, "a man to the right of the video obviously fired some projectile at him." 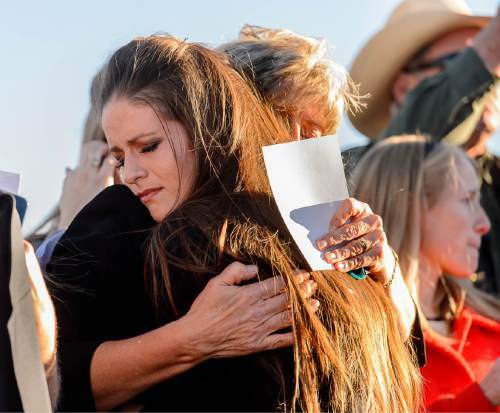 She&apos;s tried to avoid seeing images related to his death, she told The Tribune, but she made herself sit through a single viewing of the latest video, recorded by Kanab resident Shawna Cox from the backseat of the white truck that Finicum drove. She is thankful at such times for the company of her children, she said. All 11 have visited since their father&apos;s death. Tean Finicum is still a high school senior, charged with readying for calving season since her father left in early January. At 8, her mother said, Tean Finicum worked odd jobs for quarters and crocheted pot holders and a shawl to buy her own cow. "I remember the day that [LaVoy] held out his hands and she put $800 in it," Jeanette Finicum said. Had they just given her the cow, LaVoy later told his wife, "it would have taught her nothing."